Horses are like small children. They are cute, inquisitive and playful most days, but can challenge authority and be naughty at times. To make the most of their abilities they need a teacher that will make learning fun, but that creates clear boundaries between right and wrong and bring them along through solid training with no steps skipped. For Sandy, riding is as natural as walking. She first sat on a horse at the age of two and shortly thereafter was taking riding lessons at the local riding stable, but it didn't stop there. Growing up, her babysitters lived on the property and taught her more than any two legged babysitter could. She played horse tag with her sister galloping through the rows of grapevines, swam with the horses on hot summer days, and sat in the stalls watching the horses eat on days too dreary to ride. The rest is history. Sandy has numerous accomplishments, all from the back of a horse. She has seen thousands of miles of trail competing in Endurance Riding and Ride and Tie. She has been atop not only bucking horses, but buffalo for exhibition rides across California for Cotton Rosser and the Flying U Rodeo. She has taken a rescued BLM mare to a reserve championship at the Western States Wild Horse and Burro Expo competing in western, English and gymkana events. Drill team is also in Sandy's resume, having ridden with the historical Sacramento Sheriff's Posse, as well as the Penn Valley Rodeo Drill team, and instructing the Cool Country drill team. Sandy has been competing at events hosted by the Sacramento Horse Expo since 2010, including the Grace Foundation Trainers Challenge for rescued horses where she placed 3rd in her division and Project Cowgirl, the search for the next great American Horsewoman, which was aired on RFD-TV. Most recently, Sandy placed Top 5 in Charles Wilhelm's Super Horse Challenge and continues to be a part of the Super Horse Challenge each year. Continued study is always emphasized in the Smyth program. Sandy has studied with clinicians and instructors across the disciplines. Most recently, her focus has been on the principles of dressage and the classical training scale. She is a member of the United States Pony Club Horsemasters program with a D3 rating, participating in lessons, study groups, and rallies. Even outside of Pony Club, Sandy continues to improve her educational base with weekly lessons and in turn, finds new tools to help her own students and training horses progress more efficiently. With few broke horses around, but lots of young prospects, Sandy spends many a weekend at local schooling shows building the confidence of her young sale horses, as well as training horses. You can find her in western and English rail classes, but she really enjoys more stimulating ventures, such as trail and pattern classes. Weekends also find Sandy giving clinics on confidence building, obstacles, and overall horse and rider improvement. She enjoys judging schooling shows and helping participants improve their riding and showing. When time allows, you might see Sandy enjoying an occasional parade. Sandy spends most days working at her facility with all sizes, colors and breeds of horses. She follows the principles of traditional style horsemanship techniques, as well as studying concepts from classical dressage and working equitation. 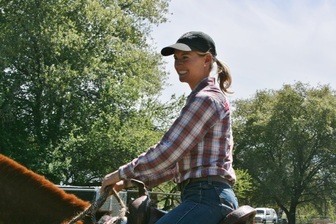 She enjoys instilling this method of training on her training and sale horses and educating clients on building skill and a positive relationship with their horse, no matter what discipline of riding they choose to peruse. Sandy would like to welcome you to "Come on down" and learn about bettering you and your horses skills to make riding what it should be, SUCCESSFUL and ENJOYABLE! In addition to her love for horses, Sandy has always had an affinity for chickens! Horse Roots - great aunt Diane and aunt Peggy preparing for the Castro Valley parade, approximately 1956. My first Arabian, Something Special, riding in Arabian costume at the Rowell Ranch Rodeo Parade in Castro Valley, 1997. 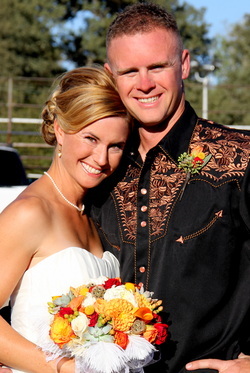 Me with the wonderful husband who I have to thank for letting me be a crazy horsewoman!